Inspiring Growth in God's Church and Colleges! SCIENTISTS WARN "ACT NOW on Pollution... don't just talk"
One of the most real proofs of whether God exists, of whether the Holy Bible really is the inspired Word of God, of whether the Bible carries authority, is answered prayer. The real test is, does it work? Is it practical? In common and modern language, does it pay off? Even most sincerely professing Christians aren't quite sure of that. Very few professing Christians ever get a real and direct answer to their prayers. And there are reasons. And one important reason, not the only reason but one important reason, is that they do not realize that Jesus Christ is really living today. That Christ, this very instant, occupies a present office, that He is very much on the job in that office night and day. That office is our present twentieth century High Priest. After the resurrection of Christ He ascended to heaven to the very throne of God the Father where He has been ever since. But, my friends, Why? Did you ever ask yourself that question; why did Christ rise up in the air, enter into a cloud that enveloped Him, and then continue right on ascending up to the very throne of God in heaven? Why? Why has He remained in heaven at the right hand of God for more than 1900 years? What did He go there for? Why does He need to be there? Why isn't He back here on earth, or why isn't He someplace else? Listen my friends, if you don't know, you'd better listen and open your Bible and begin to look into these things a little more, because it's quite important to you. Why did Christ need to remain up in heaven more than nineteen centuries? And if He is soon going to come back to this earth again, as prophecy says, well why? What's He coming for? You've heard a lot of sermons about the Second Coming of Christ, but did you ever hear anyone explain why? What He's coming for? What is the purpose of His coming? These are questions we need to be looking into. Jesus Christ needed to go to heaven in order to work out God's purpose here below, God's purpose in your life and mine. It had something to do with you; and with your life right now. Yes I think it's time you began to know something about it. It was needful for Christ to go to the Father's throne in heaven for two principal reasons. First to get for Himself the kingdom, which He had already qualified to rule while He was here on this earth 1900 years ago. The kingdom that shall become a world ruling kingdom, ruling over all the nations of the earth. And also He went in order to be your High Priest, to be right there at the very throne of God interceding for you. He is our intercessor. He is the one we need to come to for interceding with God the Father, not anyone else. Not any dead saints, not any woman, not anyone else but Jesus Christ. He is the mediator between man and God and He is our present High Priest. Do you know what that office means my friends? He's there interceding for you when you are up against it. When you are in real need. When you are overwhelmed with some emergency or a fear, or an insurmountable problem. When you're sick. When you're in trouble. When you're in sin, which is all of the time, unless or until you do come to the very holy throne of grace. I wonder if you realize how much you have suffered, and how many troubles and trials you have carried and tried to work yourself through needlessly, when if you would only come to that throne of grace as this passage says, that I just read. If you only realized and really believed and really knew that Jesus is living, that He's there now and that He is listening, and that He will hear, and that there will be an answer. Oh how many trials and troubles and everything you could have avoided. What a shame that the skeptics and the doubters don't know the practical value of that passage I just read to you in your Bible. What a pity that even the most professing Christians don't seem to know it. My friends this is something that is practical, it's something that works. I know, I put it to the test, not just once, not twice, but hundreds of times. Yes, many hundreds of times. I've gone to that throne of grace interceding for hundreds upon hundreds of you listeners. Many of you have written me, and I've gone to that throne of grace for you, and I've interceded there for you. And Christ, who is there, has Himself interceded with the Father for my request for you, and hundreds of you listeners have received the answer. You know what I am talking about because you have received the answer, hundreds of you. And you have learned that this throne of grace is real, that Christ is there, that Christ is active, He's alive and He is active and on the job right now, this minute, night and day in your behalf. I want to tell you my friends, that's mighty important, that's something that you need every day. That's something that you need in solving your problems and helping you over all the rough spots in your life. Oh I tell you, what needless pains we often carry, and what sorrows and all that sort of thing. Remember the old hymn, because we don't take it to the Eternal God in prayer. Yes, that's true. Now I want you to notice a few things there; "...in times of old God spoke to the fathers by the prophets" . But beginning with Moses, one of those prophets, the things that God spoke to the people were committed gradually to writing. And now that's all committed to writing. In the King James, the Authorized version, it says 'the' Son, but you will notice the word 'the' is in italics, which means that it was not in the original Hebrew language as the apostle Paul wrote it (I mean in the Greek language, because this is the New Testament). This was written in the Greek language. And the apostle Paul used an expression that didn't have the equivalent of the word 'his'. In fact it was just understood that it was 'a' Son, not 'the' Son, or 'His' Son but 'a' Son. Because Jesus Christ, my friends, is a divine Son of God by a resurrection from the dead. But He is the "...firstborn of many brethren" (Romans 8:29) . And we too are to become born sons of God and brothers of His, and joint co-heirs with Him. And He is the heir of all things, and we're going to see right here, and so He is the first of these sons. That's why in the correct translation, as it is in most other translations, it is 'a' Son and not 'the' Son, I commented on that in the preceding program. Now men have always rejected that Word of God. Christ is the Word, He's the living Word and the Bible is the written Word and Christ is the real author of it all, inspiring men, apostles and prophets to write it. Now the men stoned the prophets of old back in the days of the fathers, as he speaks of. In other words, the Old Testament times. They crucified the Son, Jesus Christ, but it was committed to writing and this Word has persisted and it has survived every attempt to stamp it out. And one of the ways in which this very Word, this living Word of God defies the skeptics, the doubters, the atheists, is answered prayer. This throne of grace, this priesthood that is a living reality this very moment. Of course, one of the conditions to receiving any help at that throne of grace, is that you believe. "...whatsoever is not of faith is of sin." (Romans 14:23) and "...According to your faith be it unto you" (Matthew 9:29). The doubter is never going to get anything because whatsoever he sows he is reaping, and he is sowing doubt. And he's going to reap uncertainty too. But those of us who know, and those of us who believe, who have put it to the practical test, we know that this thing is real, because we've seen the answer. We've seen it come in so many, many different ways. We've seen it come this way, that way, the other way, in so many, many times and so many ways that it is completely beyond any possibility of just coincidence, or something that just happened. Well, here's Christ, the Son and "...heir of all things..." (Hebrews 1:2 RSV). Notice that, "...in these last days he has spoken to us by a Son..." (Hebrews 1:2 RSV). He was the living Word, but now that's committed to writing and we have the written word. It was Jesus Christ. Now this starts out here in the first of Hebrews showing it how great Christ is. We need to know the importance of our High Priest. We need to know something of His powers. We need to know of His greatness. We need to know of His ability, then we need to know something also of His humanity. We need to know that He was tempted "...in all points like we" (Hebrews 4:16, that He understands, that He knows our weaknesses, that He knows every besetting sin, that He knows every infirmity, and He knows every handicap, He knows our shortcomings. He knows our weaknesses. Upholding the universe by His word of power, or, as it is in the Moffatt Translation; "He...sustains the universe with his word of power..." (Hebrews 1:3 Moffatt). Just think of that! That is Christ it's speaking of, your High Priest, who is there just waiting for you to come to Him for help when you need it. Why don't you go? Why don't you get it? It's a practical thing, I'm telling you it works. Why don't you really believe it and put it to the test? Well it isn't a thing just to put to the test, you've got to believe. But if you believe my friends, you'll never, never be let down. God has never let me down. He doesn't always answer the way we want. He doesn't give us what we want, He has promised to supply every need. And sometimes we don't understand what our needs are, we think we need something we don't, and He isn't going to supply those things. So a lot of people just lust for something and they expect God to, to give them what they lust for. Well He isn't going to answer that kind of a prayer. Now the very foundation, the very basis of getting answers to prayer is to realize that God has made many, many promises, precious promises as we read of in the Bible. Your Bible is full of thousands of promises that God has made for you, of things that He has promised He will do but always there are conditions. Now one condition is that you obey Him. You have to surrender yourself to Him and obey Him implicitly. Now I know that God has answered many prayers of people that haven't completely surrendered. They're not obeying Him in every way because they don't have all the knowledge yet. They haven't come to see, or to know, or to understand some of these things. Well God takes that into consideration, into account. God looks on the heart. And I know that there are many people that, while they don't have all the knowledge, they are obeying God as far as they know, and they're sincere in it. 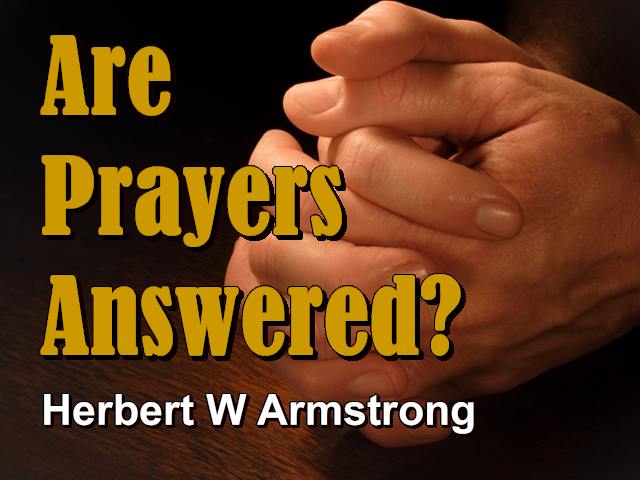 And as long as they are in that condition and not rejecting any of God's knowledge and not disobeying, I know of many people that have had many astonishing answers to prayer. And I have known of people like that who then stumble on some knowledge in the Bible, that they're doing something they shouldn't do, or that there's something they ought to do that God commands that they don't want to do. And the people that they have been having friendship with and fellowship with, even in churches we might say, and that they value, these people are not doing that way. And then they say; "Well I — I see the Bible says that; but then you know why I think I should go along with these people that I have been going along with, they're good people." And like a minister told me one time on a very important point, he admitted when I had gone to him. I was troubled about something. I had gone to a number of ministers and it's something that some ministers believe one way and some another, and denominations are somewhat divided on. I'm not going to mention the point right now because I don't want to pass any reflection on anybody but this was a very important point to me. It was something that I had to know as to whether it was even vital to my salvation and eternal life, and I had consulted a number of ministers. This was before I was really converted, but when I was studying and I was willing to make the complete surrender to God, but I had to have the knowledge of just what did He require on this particular point. Well, two ministers I had gone to of two different church denominations, were in the affirmative, that I should do this particular thing. Then I went to another that belonged to a denomination that didn't believe in doing this particular thing. And he argued and argued that I shouldn't do it, but I had already studied it very thoroughly in the Bible even in those early days. And I had only been studying the Bible, even looking into it, about six months at that time. And, well as fast as this minister would bring up something I would point it out to him in the Bible and he had to admit I was right. And finally he said, "Well," he said, "I tell you, I'll have to confess that this has troubled me all my life." He said, "It troubled me in the early years of coming into the ministry." He said, "As to whether I could come in to this denomination and support this doctrine because, frankly, I didn't believe that it was just what the Bible says. It was the way the Bible speaks but it's what my church denomination says." He said, "Well I tell you what I did," he said, "I looked at all the holy men in this church. Why there's some great men, great preachers there. And why, certainly those men must have had the Holy Spirit. Why they're such wonderful men and I look to those men. And I said; 'Well if those men can have the spirit of God the way they have, if those men can be so holy and so righteous as they appear to be, and they can believe this way, why so can I.' And so," he said; "All my life," now this man was an elderly man now, he'd been in the ministry a good many years. "And so," he said; "all my life I've gone along, I just followed those men." Oh my friends. Listen, I'm speaking to a lot of ministers, a lot of you, and a lot of you have never been quite satisfied, just like this man wasn't and he confessed it. It was a pitiful confession. You know your Bible says; "Put not your trust in [men]..." (Psalm 146:3). We're told not to follow men, not to believe men, not the traditions of men but the Word of God, we must follow and believe every word of God! And oh, I tell you my heart just leaped for joy when I get letters, as I've been having a few of them lately, and even a personal contact with one minister, ministers in churches that are coming to see light they didn't have before. It may be even light that their particular church or denomination doesn't have, but they step out on it, and they are ready to receive it, and believe in the Word of God, and follow God rather than following men. I tell you my friends, Christ is the head of His Church, and if Christ is not the head of your church, and if you're not able to repent and to follow the Word of God, and if it isn't based on the Bible as the authoritative word of God, there must be something wrong with it. One minister wrote me that he had come to the place he just couldn't talk to people about their spiritual condition any more. He had so many doubts and misgivings in his own mind and in his own heart, that he couldn't do it. You know I'm just reminded of a man that came to me one time. He'd gotten married, his wife had some money, but he came to me, he was ashamed to let his wife support him. And he told me that his wife had enough money to support them, but he said he just had too much pride to let her do that, and he said that he wanted a job. And he said; "Do you know of a vacant pastorate somewhere that I could get a job?" "Well" I said; "I only know of one vacant pastorate. I do know of one, but," I said; "you know that's such and such a denomination. And you belong to a different denomination and you would have to preach different doctrines, because they don't believe the same doctrines that your denomination believes." "Oh, oh well now," he says; "Mr Armstrong," or Brother Armstrong I guess he called me, he said; "Now, now that won't make any difference." He said, "I've got to get a job and support my wife." He says, "I'll preach anything they tell me." Well, you know, I never did tell that man where that vacant pastorate was. I thought that if a man was willing to preach anything other men told him, even against his own conviction, knowing it wasn't the truth of God at all. If he's going to follow men and not God, he's no minister, he's a false shepherd. So I don't know whether his wife is still supporting him or whether he found a job, I don't know what happened to him from that time on, but I had no confidence in him whatsoever. He's a nice looking man, very nice man in every way. Yes, he had polish, he had education, he had a lot of things that I guess that a lot of people think they need in a pastor. But the one thing that a pastor needs, he didn't have. He didn't have real sincerity and honesty and he didn't have the word of God. Oh, I tell you, it's precious. It's worth even giving your life for and I want to tell you my friends, that millions of real Christians have given their lives for this Word of God and the testimony that they held, the very testimony of Christ that is in your Bible. A real Son of God just as you and I can be. We can be begotten of God by the very Spirit of God entering into us, the very nature of God coming into us, His very life, until we can be born of Him. Then again the sixth verse. My friends, He is very God because if you worship anyone less than God, that is breaking the very first commandment and the most colossal sin of all. And it says here "let the angels, even the angels, worship him" (Hebrews 1:6). He is God. Now there's another companion booklet that sounds something like it, it is totally different, and that is 'Just What Do You Mean - Born Again?' Don't be too sure that you know. The true answer is not only surprising, it's startling. It's the most important truth that you could possibly know and it's made so plain, so clear in this booklet that you will understand. This booklet, 'Just What Do You Mean - Born Again?' Now there's the one, 'Why Were You Born?.' The other is on being born again. These booklets are priceless my friends, and yet — well they are priceless, there's no price on them, but they're beyond price because they're free. So until next time, goodbye friends.